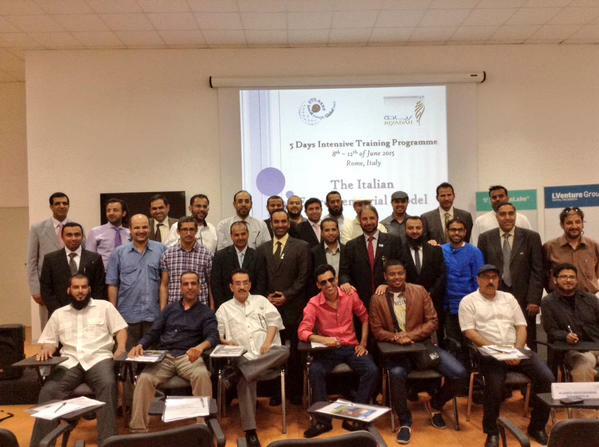 From the 8th to the 12th of June 2015 INSME welcomed a delegation from the National Entrepreneurship Institute – Riyadh for a 5 Days Intensive Training on the Italian Entrepreneurial Model. 32 Saudi Branch Leaders had the opportunity to enhance their knowledge and discuss with speakers from LUISS Enlabs, LVenture, META Group and the OECD. Sessions focused on topics such as Creativity, Communication and Marketing strategies; Effective Financing and Effective Methodologies; How to grow a business to a medium sized company in a sustainable manner; Best practices on Entrepreneurs award/competition and model analysis of a business idea competition/award; Entrepreneurship clinics. La Sapienza University of Rome also hosted a Round Table to discuss how to commercialize research results. In addition selected experts and representatives from the Agency for the Promotion of European Research – APRE and the Italian Confederation of small and medium-sized industries – CONFAPI (INSME Member since 2018) shared their experiences in promoting research, innovation and support measures to SMEs.